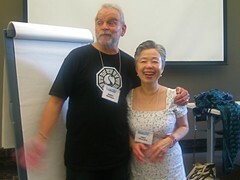 Marco Fraticelli of King’s Road Press with Emiko after the launch of the 3 newest Hexagram titles: Finding a Breeze by Grant Savage, For a Moment by Michael Dylan Welch and nothing left to say by Roberta Beary. 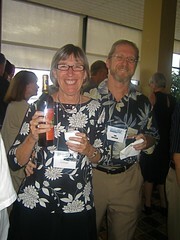 Jim, pictured here with Anita as they win the bottle of wine for solving 100% of the frogpond cryptic. With anti-story there is self-estranging complexity. The autopilot flow of narrative is troubled. Instead of stories being for some point of plot, what fits expectations, one veers from probable to what is possible. Instead of a closed narrative box where the writer elaborates on what it, the poet opens to suggests options of what could be, a potential which is never exhausted by being tidily resolved. This is the strength of anti-story. How does it end? The scenario is weakened if one were to find out. It isn’t necessary to find out what next, or how does it end. You keep the quest in the question. If one gives priority to the answer, it is not as similar to life where the reality is not ultimate outcome but the process. Anti-story is for those who can confront truth with all its jaggedness. 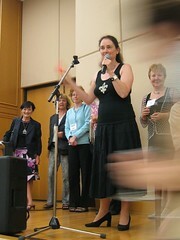 Patricia Donegan, meditation teacher, author of Haiku Mind: 108 Poems to Cultivate Awareness and Open Your Heart, Haiku (Asian Arts and Crafts For Creative Kids) and soon out Love Haiku spoke to us on Hiroshima Day (August 6) about peace, inward and outward. 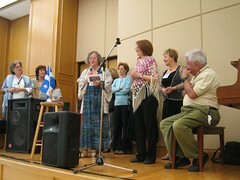 She is seen here (on right) with Margaret Chula (author of What Remains which was launched at HNA). To meditate one does not flee but observes where one is. Meditation does not have as its goal niceness but being aware and at ease despite what may arise. Aggression and compassion are equal parts of us. One opens oneself to what will rise. That may be sadness, jealousy, fear, love or beauty. You don’t know what will spill out so it takes courage to look. Thoughts and feelings are like clouds that continually rise, dwell and disappear, but past them there is a constancy of sky. We can watch ourselves and see the little furies and flurries from a different perspective. Teijo Nakamura (1900-1988), a woman haiku master from the line of Shiki, when asked about first principles of writing said the highest principle in haiku is to be honest with yourself. In meditation, one isn’t obliged to suppress oneself, correct nor to act out an emotion. Haiku is a chance to choose a peace path. Sometimes we are startled into awareness of perspective by life by accidental transcendent moments. We can choose to enter awareness as well at any time. For example, whenever we are stopped by a red light, we can choose to take a meditative pause from that opportunity and become aware of breathing and of being alive. 1) We can slow for several breaths to center ourselves. 3) We can see clearly, forgetting self and appreciate the external. Doing this practice is not suppressing self, not running from nor running after feelings, but slowing into this moment that is transitory. It is not a grabbing so much as a releasing of clinging. Being aware in this way decompresses us, allows one to be more spacious to others. Whenever we see the sky it can act as a reminder of the largeness and constancy of sky. It reminds of the openness within us. 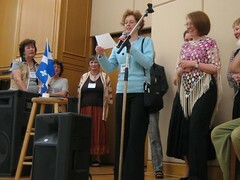 Crosscurrents was the theme of the conference with the Montreal cabaret sharing their poems on day 1. On day 2 we saw the ekphrastic results of the The Painting Project on the selected haiku submitted to theme. From the 200 sent in, 6 haiku on 6 themes were chosen. 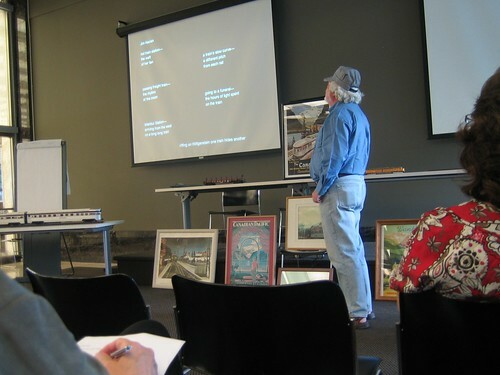 These poems were used by Claudia Coutu Radmore (pictured taking a bow) to inspire 6 paintings. 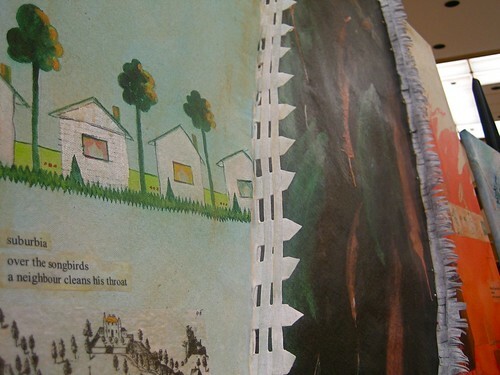 The resulting collection of paintings by Claudia Coutu Randmore and the haiku were made into a chapbook. 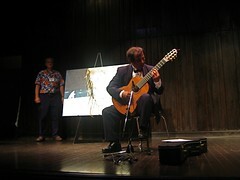 The paintings were presented to artists who interpreted them in music, in theatre or in sound poetry. Patricia Benedict did a dramatic monologue in the persona of the tippling sister of an art critic who gets increasingly inebriated over the course of her critique. Ian Tambyln sent in a track of music in absentia as a response to one painting of factory sounds mixing with piano and geese. 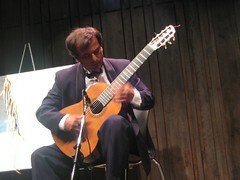 Claudio Valentino (pictured) played guitar compositions live and did segue improvizations. 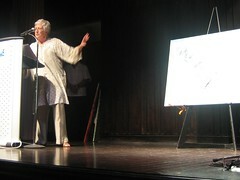 Dorothy Howard sent in a sound poetry piece that ran two tracks from different directions of the auditorium simultaneously. 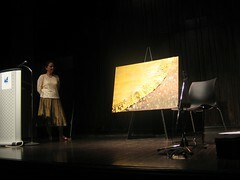 All the poems were read as each painting was presented by Angela Leuck and DeVar Dahl. 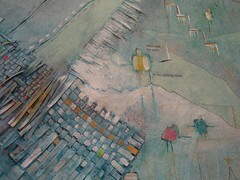 As well as this art, there was a haiga display of images by Peter Vernon Quenter by the silent auction room. 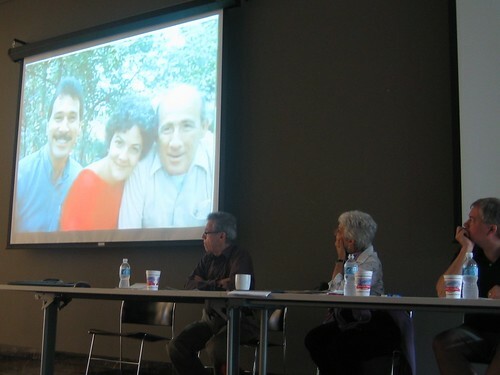 The panel discussion spent a little time watching a clip of the youtube tribute to Nick Virgilio. 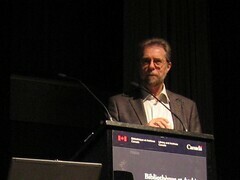 Panel was Kathleen O’Toole, Raffael de Gruttola and Michael Dylan Welch. Nick Vigilio died 20 years ago now but the effect he had is still viisble in Camden where his haiku is painted on brick walls and people still know him by name. He was an American original as de Gruttola pointed out. He was in the same class as Emily Dickinson and WC Williams. He wrote against he myth of haiku as 5-7-5 in the 60s and helped push the English form to new shapes. Once Virgilio latched onto the form, he tried to consume all that he could find and went into an intensive corresponsance with a number of people including Harold Henderson. Diving in with both feet, he became published in the first issue of American Haiku and won first prize in the second issue. 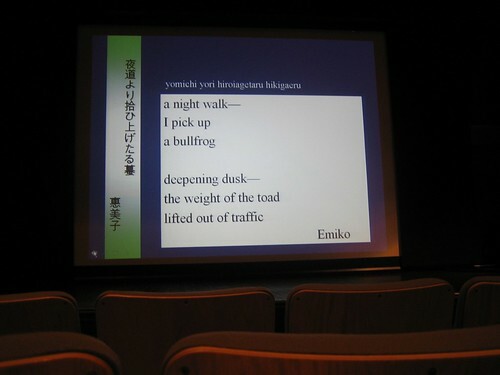 He thought haiku worthy of study and essays and encouraged others to write essays on his haiku. O’Toole said this was in part because of his nature as a promoter and partly from his desire to push himself, to burnish his poems to get to the purist state possible and wanted all the mentoring he could to learn. 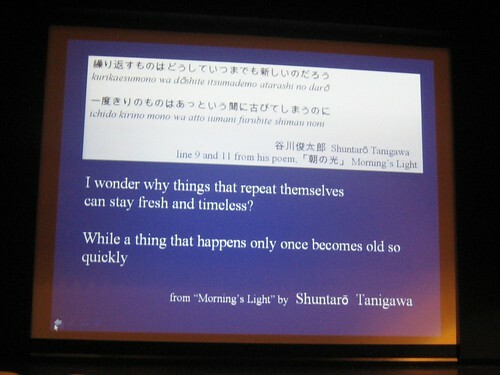 On day 2, Emiko Miyashita was discussing haiku from a haiku-translater’s point of view. 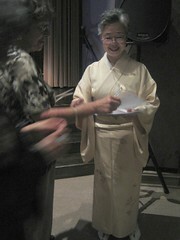 She gave poems in Japanese and two versions of English. 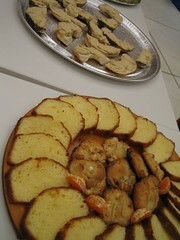 She led discussions around strengths and weaknesses of what is conveyed and left out. Emiko looking at her slide. Part of the effect of doing haiku is to instill a seasonal awareness in self. If one is familiar with white radishes, the autumn season of harvest, and the habit of preserving them for winter, and how women gather by the riverbank to wash them, we can feel the suggestion of hands getting cold in the stream’s water. The sadness of closure can be invoked by the repetition. It isn’t as rich and nuances without that context. We are missing part of the cultural picture. 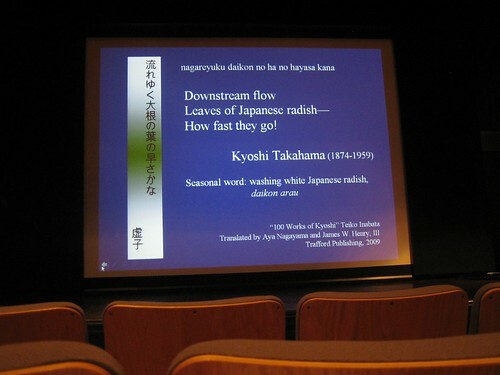 Now that haiku are written worldwide in Japanese and English, there is a diversity in season’s meaning. For example, spring begins on Feb 4th in Japan and March 21st in the west. Words are drawing on a variety of culture, language, climate and religion which make the meaning transference not as sure. 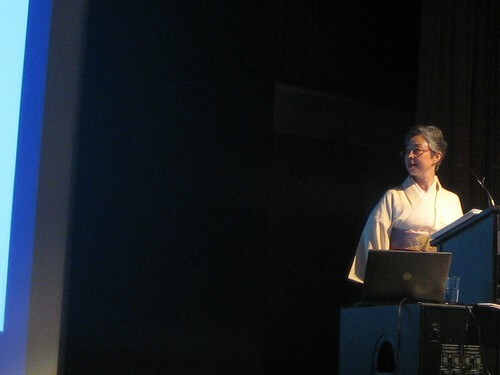 By tracing her development in learning haiku in Japan, and sharing ideas of Basho and Kyoshi Takahama, she presented how central kigo (season words) are in Japanese haiku, and ephasized that haiku is a seasonal poetry. Still, she asked, what is the appeal of writing about seasons? 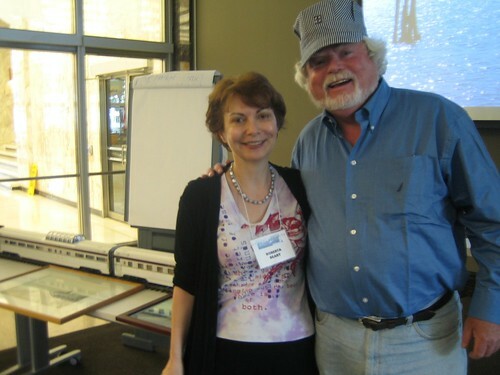 Many people write haiku about trains and were on hand to read their pieces. Rich is doing a collection. 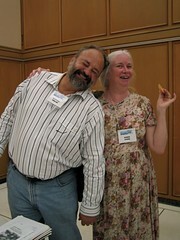 Roberta Beary and Rich Schnell after the train haiku presentation. Amazingly enough the conference is all through already. Many ideas and connections were shared. It was a warm atmosphere throughout with events and community coming together beautifully. 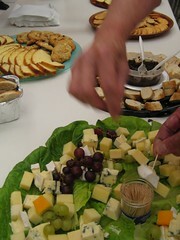 You can browse this photo album of HNA events. 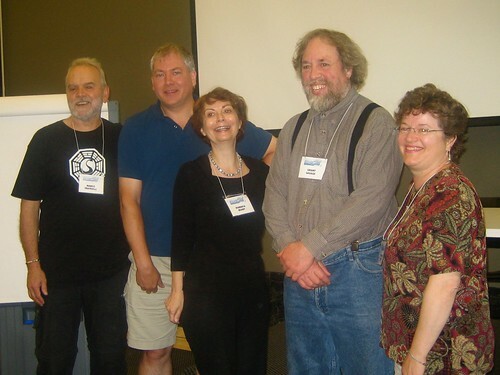 Deborah Kolodji has made a post on Day 3 of the haiku conference. I believe her album is viewable as well. 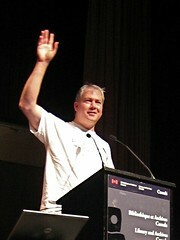 Garry Gay talked about how when the conferences started, the world was different. A renga couldn’t be done by email, but by letter mail. You would see people’s names appear in journals but people didn’t meet face to face. 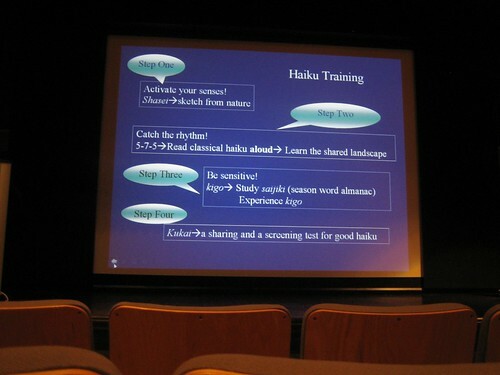 The conference aimed to connect the disparate tribes of haiku. He, Paul Miller and Michael Dylan Welch in 2005 incorporated the organization so it is non-profit. Although there are organizers it belongs to the community. “A conference is a fragile thing and without support it will disappear”. It’s organized at grass roots level each time by a different group. 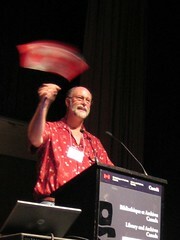 Michael Dylan Welch surveyed those present on which conferences each had attended. Only William Higginson had been to every one of the previous 9. 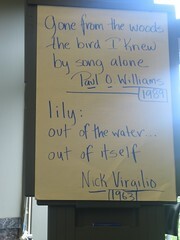 There was a tribute reading of 9 of Higginson’s poems. 1) Get lots of sleep. It’s like drinking from a fire house. Water is sweet but you’re at risk of drowning. Pace yourself. 2) Be methodical. Look at the anthology and make a list of who you definitely want to speak with so you don’t come to the end and miss some people. 3) Pick a few things and do them well rather than rushing to and fro trying to catch half each of a couple sessions that run concurrently. 4) Support the book sellers. Publishing is often a loss or close to it. Look thru the book tables and bring some home. 5) Don’t be shy. Pick a few faces you don’t know. Take the initiative if you are new, or an old hand. Ask people to sign your anthology or invite people for lunch, introduce yourself. Get to know the community. 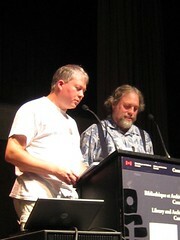 Michael Dylan Welch and Grant Savage led the anthology reading of “Into Our Words” where people if present, read their own. 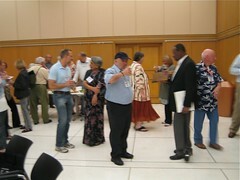 People travelled to this conference from across Canada and the U.S. and from overseas (India and Japan). Angela Leuck and the Montreal poets gave a reading at Le Terasse Haiku Cabaret. It was moderated by Pam (seen here with her twin sister reading twin haiku they each did of the same moment). 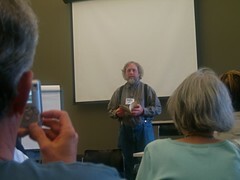 Sibley gave his talk on walking the traditional Buddhist pilgrimage, 20-30 km/day, with a 14 kg pack, for 2 months, doing 88 temples over 870 miles as well as forging relationships with the quiet inner and rhythms of foot-speed and of those immediate 3 he walked with. He found that in responding to the outer world for an extended time he learned how to extract from experiences the essences. The uneventful stretches not the exciting highlights were the times that impacted most. Walking that much per day allows us to shift our relationships and hear another quieter self.